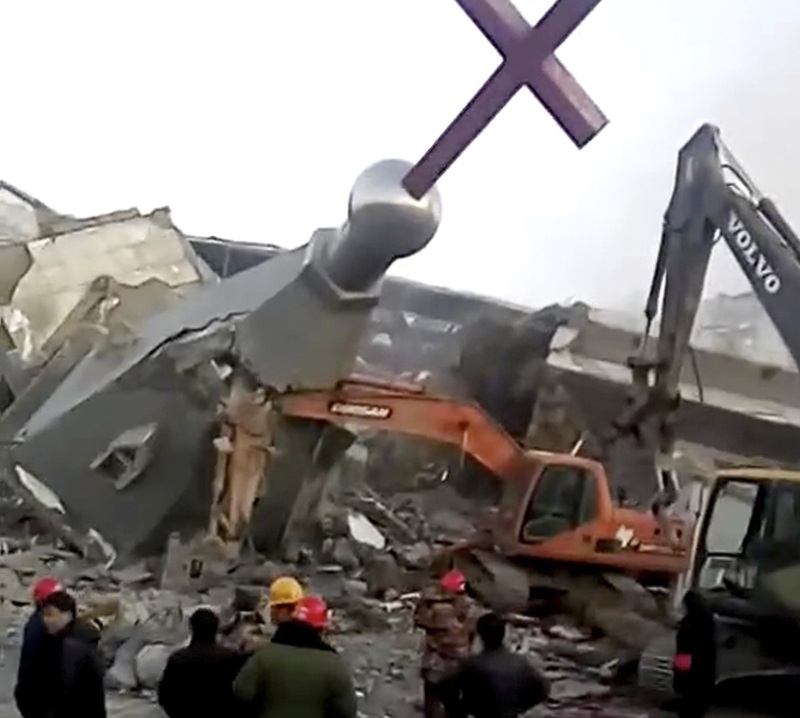 Shocking images of a church dynamited by government officials in China, the second to be demolished in recent weeks, may foretell a deeper crisis for Christianity in China today. Chinese military police detonated explosives in an underground worship hall to bring down the Golden Lampstand Church, a non-state-affiliated church in the northern province of Shanxi, on Jan. 9, according to China Aid, a Texas-based Christian advocacy group. According to several media reports, church leaders have been detained,and attempts by America to reach them for comment have been unsuccessful. The destruction of the church, where more than 50,000 Christians reportedly worshiped, and the Dec. 27 demolition of a Catholic village church in Huyi, in the separate province of Shaanxi, are feared by many Christians as signs of a nationwide drive to tighten state control over ecclesial life in China. China mandates that all churches register into a state system, but many refuse to do so, fearing state control. Local authorities often crack down on unregistered churches under the pretext of land, building or financial violations. Many Chinese Christians connect the demolition of the two churches to a revised set of “Regulations on Religious Affairs,” set to come into effect on Feb. 1 and fear the coming rules have emboldened officials to "act tough." The new regulations are part of President Xi Jinping’s broader campaign to shore up national security and resist what it sees as the “foreign infiltration” of religions in China. Xu Yonghai, the leader of an unregistered “house” church in Beijing, said he is bracing for more state harassment. Mr. Xu and two other members of the Holy Love Christian Fellowship were sentenced to two years of hard labor in 1994 for allegedly “insulting” the government in an essay that had described the difficulties churches face in China. He was jailed again for two years in 2003 for “endangering state security” by documenting the destruction of house churches in Hangzhou’s Xiaoshan district. And in early 2014, 13 members of Mr. Xu’s church, usually attended by less than 20 people, were detained for a month after they tried to hold a Bible study. Mr. Xu says that police still question him and interrupt his church’s meetings from time to time. “The room for religious belief is definitely narrowing,” he said. “We Christians have to be prepared to follow in our predecessors’ footsteps of the 1950s,” alluding to Mao era persecution of Chinese Christians. When the Communist Party took power in 1949, Chinese churches were forced to sever links with foreign Christian churches. They had to join state-sanctioned “patriotic” churches or face prosecutions. China’s already-tight control over churches will be strengthened by the new “Regulations on Religious Affairs,” said several experts on Christianity in China. The regulations say that religious groups should “practice the core socialist values” and must not “endanger national security” or harm state interests. Under the new regulations, lower-level officials can oversee the activities of China’s religious communities—a move expected to lead to intensified harassment of Christians and churches. Amnesty International has described the new rules as “draconian” and warned that officials may ramp up the persecution of those practicing their religious beliefs outside of officially sanctioned organizations or churches. The human rights advocates expect the banning of certain religious activities and financial penalties on religious organizations. Under the new regulations, lower-level officials can oversee the activities of China’s religious communities—a move expected to lead to intensified harassment of Christians and churches—and large fines can be imposed on unsanctioned activities. For example, organizers of unapproved overseas trips for believers to attend conferences, or for Catholics to attend papal Masses, could be fined up to $30,000. Mr. Yang saw the demolition of the Golden Lampstand Church as signaling a new round of persecution against unregistered churches. A similar campaign that started in 2014 in Zhejiang Province led to the removal of at least 1,200 crosses from spires of mainly state-approved churches. The campaign to take down crosses led to many clashes, and a number of church leaders and believers were detained or jailed. Pastor Bao Guohua and his wife Xing Wengxiang, who opposed the removal of crosses, were sentenced to 14 years’ and 12 years’ imprisonment in February 2016, according to Amnesty International. But Mr. Yang said the revised religious regulations will face strong resistance from China’s Christian community, and they may not be effectively implemented because enforcement would demand a huge amount of government resources. Another house church elder in Beijing, who asked to remain anonymous, said political regimes in history have never managed to destroy churches completely. When Chinese churches have been forcibly closed, Christians continued to meet in small groups, he said. “They can destroy physical churches but more ‘invisible’ churches will emerge,” he said. “You close one and it turns into 50. This article also appeared in print, under the headline "China’s Christians face new restrictions as religious code is revised," in the February 19, 2018 issue. Verna Yu is America’s Hong Kong correspondent.